Insane Gainz has a massive cult following and for good reason. This intense testosterone booster includes a clinical dose of D-Aspartic Acid which is clinically proven to raise natural testosterone levels by 42% within 12 days. 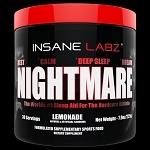 Insane Gainz also contains other ingredients which work in sequence with DAA to ensure your body gets the TEST BOOST you need to smash the weight room.